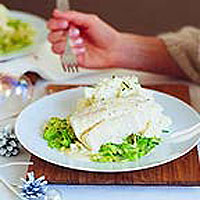 Icelandic cod has a pure, sweet taste, that is enhanced here by poaching in Gewürztraminer, an aromatic wine. The cooking broth is then transformed into a scrumptious but very grown-up creamy mustard sauce. Preheat the oven to 150ºC, gas mark 2. Place the butter in an ovenproof baking dish and place near the bottom of the oven to keep warm. Then place the wine, bay leaf, parsley, thyme and black peppercorns in a non-corrosive, wide saucepan with the onion and the celery and set over a medium heat. Once it comes to the boil, cover and simmer gently for 15 minutes. Slip the first 3 cod fillets into the hot broth, cover and poach for 8-10 minutes or until just cooked. Using a fish slice, gently transfer them to the buttered baking dish, cover with foil and place in the oven. Repeat the process with the remaining fish. Now make the sauce by straining the poaching liquid into a smaller non-corrosive saucepan. Boil vigorously for about 10 minutes or until the liquid has reduced by two-thirds. Stir in the double cream and continue to boil vigorously for about 8 minutes, or until it has thickened into a rich, creamy sauce. Remove from the heat and stir in the mustards. Adjust the seasoning to taste. Serve. Mustard becomes bitter if boiled, so if you are reheating the sauce do it gently and never allow to boil.